First graders from Graves Elementary School in the Village of Summit are on a mission to improve their community and their walk to school. Hundreds of kids in this southwest suburb walk to school every day. 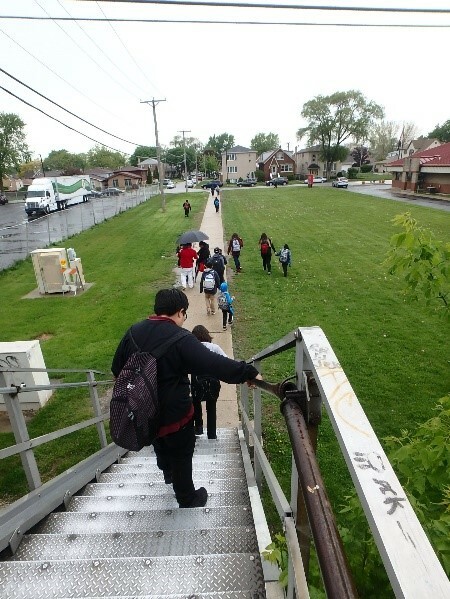 While the young students enjoy their commute, they also encounter barriers that need improvement. 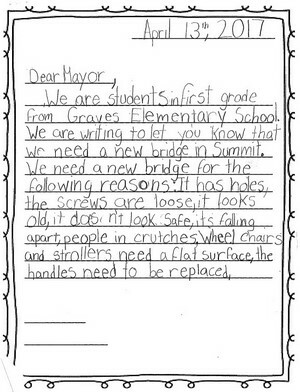 In April of this year, a first-grade class sent Mayor Sergio Rodriguez a letter (see below) asking for a meeting and requesting that the village work on improving the pedestrian bridge that offers one of the few connections between the north and south sides of Summit, which is separated by railroad tracks. The bridge (pictured left) is used by hundreds of students each day to get to and from school, but it is slippery in wet weather, icy in the winter and is especially difficult to navigate for those with disabilities. 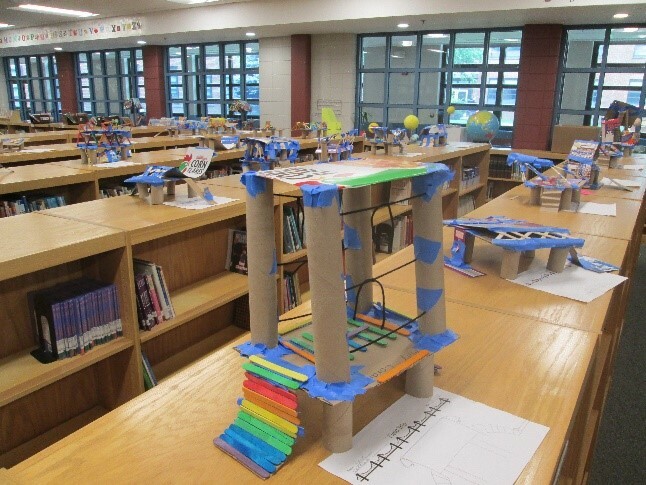 The students also unleashed their creative skills and designed models of what a safe bridge could look like. The models are made of colorful pop-sickle sticks, yarn and construction paper. They are now proudly displayed in the school library (See bottom). 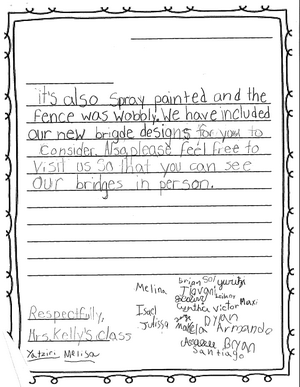 Armed with questions and ideas, the first graders met with the mayor this spring. Currently, as part of a Healthy HotSpot grant from Cook County Department of Public Health, Active Trans is working with the Village of Summit to develop an active transportation plan for the community. The plan lays out a low-stress network of bike lanes, sidewalks and trails to improve barriers associated with bicycling and walking. The plan also includes recommendations to address the safety of the pedestrian bridge. In part because of the advocacy of Graves Elementary and their first graders, the village is now developing a strategy to work with the railroad company to make improvements. And as further testament to the school’s efforts to promote walking, this June Graves Elementary became one of eight Cook County schools to receive the 2017 Let’s Move! Active Schools National Award. The prestigious award, started by former first Lady Michelle Obama, recognizes the nation’s top schools that are encouraging physical activity and education. It takes a team to make positive change happen in a community. Summit is a great example of how public officials, schools and residents of all ages can work together to create a healthier community.